Young athletes with disabilities have hit a soft spot with the employees of Australia's corporate giants. As part of Workplace Giving Month, Reporter Nadia Boyce looks at corporate volunteering with people with intellectual disabilities. Young athletes with disabilities have hit a soft spot with the employees of Australia's corporate giants. Not for profit organisation, Special Olympics Australia, which is providing sporting opportunities to children and adults with intellectual disabilities, has opened its programs to corporate volunteers and is partnering with companies around the country who want to get their workers out of the office and into the community. For corporates, it has proven to be a hands-on, rewarding and sometimes confronting way to integrate CSR into their operations. Healthcare company Bupa has a long history with the Special Olympics. Initially connected through workplace giving, a seven year relationship has seen a transition to a volunteering partnership. Bupa employees are given two paid volunteering days per year, where they can be involved in Special Olympics sporting events in Adelaide, Brisbane, Sydney and Melbourne. 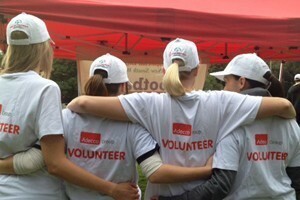 Recruitment company Adecco began it’s Special Olympics program in mid-2012, marking the first time a structured volunteering program had been in place at the company. Employees are given one day per year to volunteer. Employees from the global computer systems giant, Cisco also volunteer at Special Olympics, but on a quarterly basis. A recent sporting event saw over 50 Cisco employees volunteer their time together. Virtual Sales Account Manager at Cisco, Sally Lo, says that volunteering with the Special Olympics has been universally memorable for employees. “Special Olympics athletes are not your everyday people that you see in your workplace – that’s why it’s such a special experience. “Our volunteering efforts directly impact the participants and their carers and that contributes to a great day out,” she says. But new experiences are not without their challenges. “If you’ve never worked with children or adults that have some sort of a disability, it can be really confronting,” Lo says. “It’s really important to do an in depth briefing or let the volunteers have a look before they start to find out what volunteering with Special Olympics is all about prior to the event, so they know what to expect,” she says. Colleagues have been able to reduce personal anxiety about interacting with intellectually disabled people, Lo says, adding that she would certainly promote the program to others. Kelly Ward is a Senior HR Executive at Adecco. She has been instrumental in setting up her company’s corporate volunteering partnership with the Special Olympics. For Elizabeth Still, Head of Corporate Responsibility and Sustainability at Bupa, what stands out is the way the Special Olympics treats their athletes. “They make the athletes the most important aspect of the day. I love how their focus is on trying and not winning,” she says. For the companies involved, the program has had a positive impact on workplace culture. “The better employees work together the better a company will perform. These types of opportunities really form those bonds, break silos and offer a collaborative approach to working. It brings the community into the company which is crucial. Corporates nowadays all need a social license to operate,” Still says. Lo says that there are clear benefits in employee relations. “It’s really about team bonding. It’s about understanding and getting to know your team on a different level, a different side to them. You get to see the way that your colleagues react to different situations and different people. Ward said that for the impact of corporate volunteering to be felt broadly throughout the workplace, building participation rates was essential. It is her hope to reach a point where the enthusiasm of her colleagues is fully reflected in the numbers who ultimately volunteer. Ward will conduct of review of Adecco’s program at the end of the year where she will consider how participation rates may be raised. The programs at Adecco, Bupa and Cisco have come with both challenges, benefits and logistical issues. It was an extensive process to locate the perfect partnership at Cisco, Lo says. She researched over 20 charities and was surprised to see many charging fees to take on corporate volunteers. “The Special Olympics is not like that – they never pressure you to give them anything and they are very welcoming. That’s what differentiates them from anyone else that I’ve ever worked with – their level of professionalism,” she says. At Cisco, a key logistical issue going forward will be managing volunteer numbers, Lo says. A recent Special Olympics event with 60 athletes was attended by 50 volunteers. “If you have too many volunteers per athlete sometimes you feel like you might be wondering around doing nothing. You can't really say no to people when they want to volunteer their time,” she says. Ward says that since putting a structured program in place at Adecco, the takeup rates have been higher, as events needing volunteers can easily be promoted internally. Collective organisation has proven more efficient than the company’s previous model where employees were required to find their own placements. The Special Olympics was a particularly attractive partner as a nationwide organisation that could provide opportunities to staff in different parts of the country. Now the company hopes to streamline the Special Olympics’ rollout in regional cities with its own expansion of the corporate volunteering. Ward ranks corporate volunteering very highly when compared with other forms of CSR. The program, she says, is mutually beneficial. The company benefits from connections to be made within the community and through the morale of its employees, while the Special Olympics is able to deliver its programs with assistance. Lo can see the program widely benefiting corporates. Still says that the benefits of promotion come in the form of greater involvement, and for that reason, much of Bupa’s communication about the program is internal to its employees. Corporates taking action, she says, is always a positive story. Learn more about Special Olympics Australia here.